GADSDEN, Ala. -- Ivan Stobert was in many ways the ideal immigrant. In 2006, he traveled from Moldova to the United States on a visa. While here, he fell in love and in 2008 married a U.S. citizen. He became a permanent legal resident, bought a house in the Atlanta area and started a cleaning business. 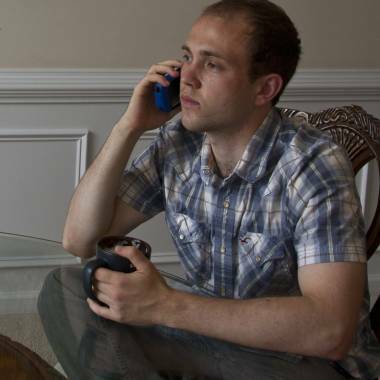 Ivan Stobert, a 25 year-old Moldovan national, speaks to his lawyer from his home in Atlanta. Despite holding a green card, he says he spent nearly a year in the Etowah County Detention Center last fall after accidentally checking the "U.S. citizen" box on a motorcycle license application. But the love affair ended in December 2010, when the slight 25-year-old found himself locked up indefinitely in the Etowah County Detention Center in northeast Alabama, charged with an aggravated felony and facing deportation. More than 250 detention facilities around the country are used to hold the tens of thousands immigrants detained each year by U.S. Immigration and Customs Enforcement, known as ICE, as they await court dates or deportation. Even those accused of relatively minor infractions, such as overstaying a visa, can be held for months – or even years – fighting their cases without the benefit of rights and resources guaranteed to those accused of criminal acts. Immigrant advocates have for years called Etowah one of the worst facilities in ICE’s sprawling detention system. In late July, conditions in the isolated facility, which also serves as the county jail, prompted some immigration detainees to refuse food in an act of protest to demand better treatment. A hundred detainees signed a letter to ICE and operators of the jail. “Some Detainees life’s (sic) are at stake and to disregard this fact is inhumane and not in compliance with ICE (standards),” they wrote. “They were sending us rotten food, food that’s spoiled,” detainee Javian Lawrence, a 27-year-old Jamaican national, told NBC News in a phone interview from the jail. Those detained in Etowah are locked up for myriad reasons -- including overstayed visas or entering the country illegally. But others, like Stobert, say they were caught in the immigration law enforcement web by mistake. Stobert says his troubles began in April 2009 when he accidentally checked the “U.S. Citizen” box on a motorcycle license application. He said that even though he presented his green card and Moldovan passport along with the application, indicating he was in the country legally, two law enforcement officers arrived at his home more than a year and a half later and arrested him for providing false statements on a government application. He was booked into jail in Atlanta, held for more than a month, then transferred to Etowah. For what he says was an innocent mistake, Stobert spent nearly a year behind bars. And while he was locked up, he says, he lost his house to foreclosure, his wife left him and his budding cleaning business collapsed. Chart shows the number of immigrant detainees held by U.S. authorities by year. * = projected figures. After scandals including sexual abuse by guards, deaths in custody and the detention of children, ICE announced in August 2009 plans to consolidate its network of detention centers, many of them county jails, and improve oversight. Three years later, however, the agency still houses nearly 34,000 immigration detainees on any given day in some facilities that critics say are intended to be short-term way stations in the criminal justice system, not used for long-term civil detention. 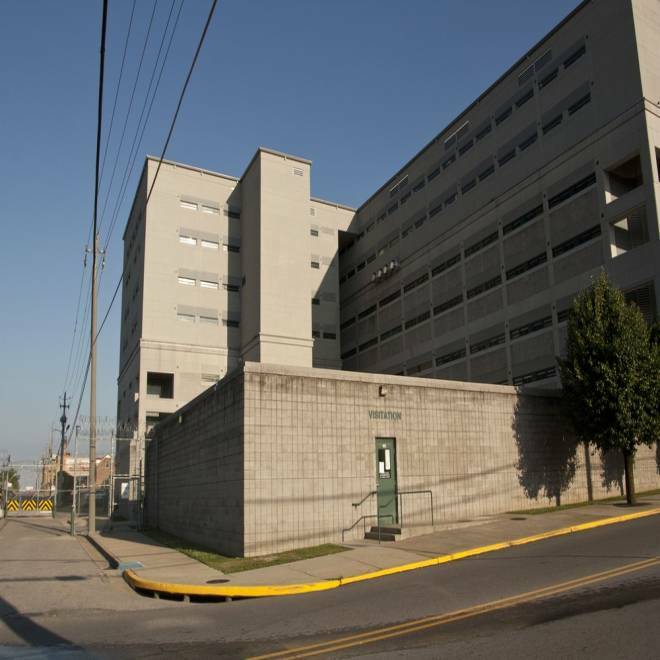 Many of the more than 300 men at the Etowah County Detention Center – who spend much of their time in cramped cells, denied access to the outdoors – face open-ended stays in the jail. They include asylum seekers; immigrants fighting deportation or petitioning for special status that would enable them to remain in the U.S.; immigrants from countries unwilling to take them back; and people without the proper paperwork to be repatriated. ICE’s decision to hold long-term detainees in the Alabama jail is rooted in cost-savings: At just $40 a day per detainee, Etowah has one of the lowest rates of any ICE detention facility in the country. But it also has its challenges. At the end of 2010, ICE attempted to terminate its use of the facility, citing a number of factors, including expensive transportation costs to and from court, and lack of access to ICE staff and attorneys. Its remoteness also makes it difficult for lawyers and the detainees’ family members to visit. But money from ICE has become an essential source of revenue to the county, bringing in about $5 million a year that funds a host of programs and services in the community. Losing that revenue would be a “devastating blow” to the budget, Etowah Sheriff Todd Entrekin told the Gadsden Times in 2011. After a political fight to keep the detainees there, the facility came under the control of ICE’s New Orleans field office. About 100 female detainees once housed at Etowah were moved out. New Orleans now uses the 350 beds Etowah reserves for ICE to house male detainees, almost all of whom ICE expects to linger in the system. Both ICE and Etowah County officials declined repeated requests by NBC News to speak on camera. But advocates for the detainees object to using a jail like Etowah to detain immigrants for the long term. Detainees currently are held at Etowah an average of 49 days, records show. Yet some, like Stobert, remain far longer. Immigrants face major barriers to challenging their detention and deportation, in part because they operate in a civil, rather than criminal, system. To sneak across the border is a crime, but to overstay a visa – one of the most common ways that people lose legal status – is a legal infraction akin to a moving violation. But due to the civil nature of the crime, immigrants caught in the deportation process have fewer legal protections than someone accused of murder. They lack the right to representation, a speedy trial, double jeopardy protections or standard habeas corpus. A report by the Vera Institute of Justice found that between 2006 and 2007, more than 80 percent of detained immigrants fought their cases without a lawyer. Stobert was one of the lucky few who could afford one. Immigration lawyer H. Glenn Fogle at his office in Atlanta. Even so, in April 2011, an Atlanta immigration judge ordered Stobert’s deportation, claiming he had intentionally checked the U.S. citizen box. Stobert, already locked up for over five months, decided to fight and his lawyer appealed. He applied to be released on bond, which would include supervision that costs much less than detention. The motion was denied. Fogle, Stobert’s attorney, said he believes ICE keeps people in Etowah so that detainees will give up hope. Many of the detainees in Etowah have complicated cases, stemming from criminal charges or diplomatic intricacies. Even some willing to be voluntarily deported cannot be. Countries like China, Cuba or certain Caribbean Islands regularly rebuff U.S. efforts to return their citizens. Immigration detainees have constitutional protections against indefinite detention. In 2001 the U.S. Supreme Court ruled ICE has approximately six months to deport or release immigrants after their case is decided. ICE can, however, hold people longer if it can show that certain special circumstances apply – such as the detainee posing a terrorism risk – or if it can show an immigrant will be deported in the near future. But ICE records show the agency regularly opposes even the release of detainees who it has struggled to deport, and prevails. Barbados national Hanson Marshall, 35, for example, has been detained by ICE for 23 months. He spent time in detention centers in five states before arriving at Etowah last June. Marshall, who wears the green shirt that at Etowah signals he’s considered a medium-risk detainee, came to the United States legally when he was 16 and settled in Brooklyn with his family. His visa expired, but he stayed. Marshall had tangled with the law. In 2003, he pleaded guilty to a misdemeanor charge for possessing a firearm. In 2010, he was picked up in New York City on a warrant for a misdemeanor. He spend a week in jail. The day he was to be released, he was instead transferred into ICE custody. ICE has switched tactics in recent years, concentrating on deporting more immigrants facing criminal charges, like Marshall. But in his case, the deportation has become a Catch-22: Until Barbados issues the necessary travel documents, the United States can’t send him home. ICE, which operates the largest detention system in the U.S., relies heavily on jails like Etowah to detain immigrants. Critics have argued for years that jails are not appropriate for ICE detainees, because they live as prisoners -- wearing uniforms, confined in small cells and forced to mingle with general inmate populations. The Etowah County Detention Center in Gadsden, Ala.
ICE, too, has emphasized that detention is not meant to be punishment. On a tour of the Etowah County Detention Center in May by NBC News, ICE detainees in Unit 10 crowded to the door of the glassed-in recreation area to speak with reporters. Men from countries like Sierra Leone, Morocco, Poland and Guatemala shouted to be heard while other detainees worked out in the room behind, lifting weights and doing pull-ups on metal bars. The rec room in each unit provides the detainees with their only exposure to natural light or open air, both of which come through a narrow grating high on one wall. Otherwise, detainees go outdoors only when bused to court proceedings, for emergency medical care or when taken to the airport to be deported. The facility that houses the detainees is by most appearances a jail. Two levels of cells line the large rectangular units. Detainees eat at tables in the middle of the pod, and bunk in small cells behind heavy doors. Mattresses are thin, the showers are bare and public. Like the rest of the jail’s inmates, the immigrants are not allowed contact visits with family or friends, except under special circumstances. Visitation takes place via a video screen. Detainees interviewed said the no-contact policy discouraged their spouses, children and friends from driving hours to see them. Detainees also said the commissary, where they can purchase extra food or toiletries, is prohibitively expensive. Phone calls, often the single link to families sometimes thousands of miles away, can cost up to $1 per minute. 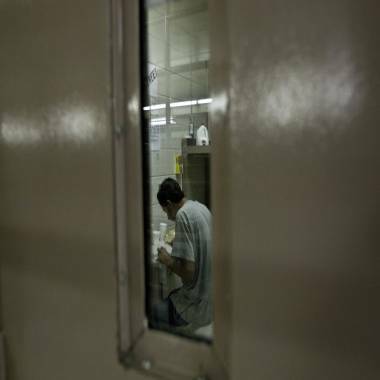 An immigration detainee writes in his cell at the Etowah County Detention Center. 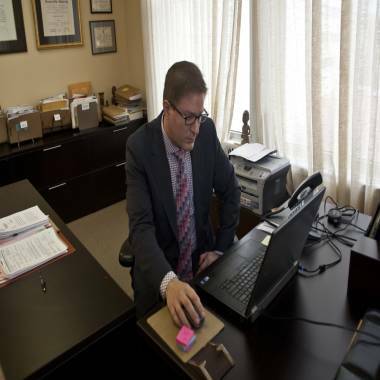 Immigration lawyers, and courts, are also difficult to access from Etowah. Many detainees described inadequate medical care, although the detention center operates a clinic with a full-time nurse and weekly visits from a doctor. ICE’s own reports have noted deficiencies. A 2008 inspection report noted two suicides by county inmates within a six month period. ICE records from that year also indicate that a female detainee tried to hang herself in her cell. The food supply was the subject of a grand jury investigation in 2010. Jurors concluded it was sufficient. Since coming under control of the New Orleans Field Office, ICE detention monitors have worked “worked hand-in-hand with facility staff to address these issues and work to implement corrective where necessary,” ICE spokeswoman Gillian Christensen wrote in January 2012 in response to a query about conditions. Human rights monitors from the Women’s Refugee Commission also indicate Etowah has made steps to improve the facility, but a recent report from the group indicated problems persist, including complaints about food. The human rights group said the county had been addressing some of the concerns raised in the report. During the visit by NBC News in May, the menu listed meals with beans, tortillas, fruit, hot dogs, and hamburgers. But Stobert and other former and current detainees said such improvements were recent. Also new are some niceties in the units at Etowah that house the immigrants, who were recently allowed to participate in programs formerly available only to county inmates. The wall of one, for example, is adorned with a painted mural of the world. There also are fish tanks in each unit. Officials have also implemented programs for detainees and improved access to medical care, among other reforms. According to an ICE spokesperson, inspectors found no violations during the facility’s most recent review. Etowah County is currently soliciting bids to build an outdoor recreation center on top of the jail in order to bring the facility up to ICE’s most recent standards, which would also increase pay for officers who oversee ICE detainees. In May, a detainee in Unit 4, which holds those with the lowest risk classification, was training a dog as part of a new Puppies Without Borders program, intended as an “outlet to relieve the stress of being detained.” The man, a native of the Philippines who declined to give his name, said he was being held while he awaited a decision on his petition for a U-Visa, a special visa offered to immigrants who have been victims of a crime. Smiling as the puppy scurried across the catwalk, he said Etowah was far better than the ICE jail in Illinois that he was transferred from. But by July, when detainees staged a brief hunger strike, many complained that the facility had reverted back to some of its old ways, serving food that was rotten and nutritionally inadequate. Following the protest, detainees in Unit 9 were on lockdown, held for nearly 22 hours a day in their cells, according to detainees and their advocates. Nonetheless, they say the strike may just be the first in a series of actions aimed at forcing ICE to move them out of Etowah. Read Part 2: When ICE sought to shutter immigration jail, politics intervened.